Add a photo of you from your camping days hint: the more embarrassing, the better! Write a little bit about what camp means to you and why you've chosen to be a Canoe Head! Send messages to friends and family to kick-start your fundraising efforts! Don't forget those former camping friends who understand the magic of camp. It only costs $1,088 to send a deserving kid to camp and change their life forever! Set the pace and donate to yourself! Your supporters will be eager to help you reach your goal if they see that you yourself are supporting the cause! Personalize your communications. Share your story about what camp means to you or why you’ve chosen to support Amici campers! It’s camp. Feel free to make it fun! Hold a fundraising event for yourself or with your team! 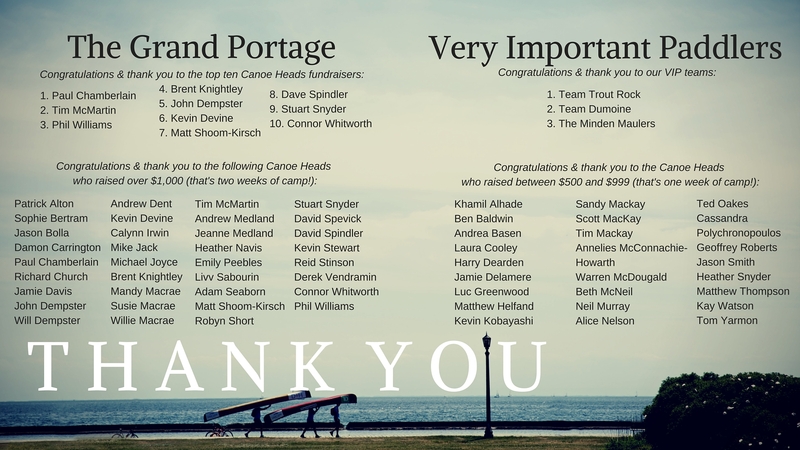 Here are some successful ideas from past Canoe Heads participants: a Bar Night, a Karaoke Night, a Yoga-thon, a Raffle, a car-wash. Paste your fundraising link in the signature of your work, personal or school email with a short but sweet message! Utilize social media! Shout it from the rooftops that you are participating in something truly unique and amazing. Here are some ready-to-go photos to share with your social networks. Don't forget to include the link to your personal fundraising page in the photo description so your friends know where to donate. And finally, have your supporters donate using PayPal, and PayPal will match their donation by 5%! Amici’s Canoe Heads for Kids is the most fun you'll have this year, but it is also a work out! Starting with a 7.5 km portage along the waterfront and ending with 7.5km of paddling Lake Ontario, you and your team will transport your canoes for this journey, which means that while you’ll be able to swap out and share the load, a certain level of strength, endurance, and experience will be necessary. As we ask that you bring your own canoe for the event, you will be aware of the weight of your boat – tripping canoes can weigh in anywhere between 35lbs to 80lbs. That’s heavy! For your safety and the safety of other participants, we ask that you prepare your body for this undertaking. Here are a few tips and activities that you can try to help get yourself and your team ready for the big day! Do a mock Canoe Heads day with your team! After a long winter, it’s a great way to practice getting the canoes on your shoulders, portaging, and swapping the boats from one team member to the next. Walk the route! Familiarize yourself with the beautiful Toronto Waterfront route and fully understand the distance that you will cover on event day. Check out the route here! Notify your doctor of your plan to paddle and portage. They will offer personalized tips to help ensure your health and safety during the event. Did you know that many employers sponsor matching gift programs and will match charitable contributions made by their employees? Awesome sauce, am I right?! Why not see if this can apply to your personal Canoe Heads fundraising? Effectively, this could double your support and double your impact, either sending kids to camp for twice as long or by sending twice as many kids to camp. Here is a list of matching gift companies (note: this is not a comprehensive list.) Please check with your employer to confirm participation and application procedure.